TOUCH OF CREATION: Season's Greetings!! This is so cute! Love the sketch and of course the image is adorable! So happy to have you play along in my Monday Morning challenge! 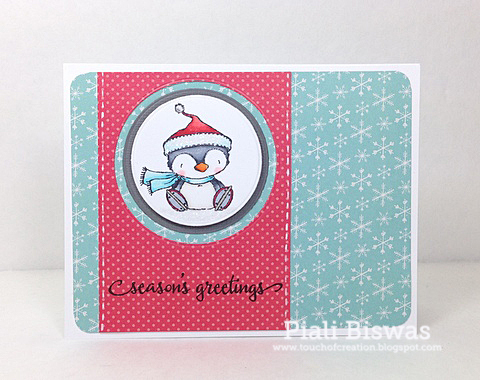 Cute and adorable card Piali! and cute it is Piali. I love your sweet little circle with your image. Love that guy and the color combo! Thank you for sharing your cute card with us at TioT's this time. super cute card Piali...I luv this! I am thrilled you played along with Simon Says Stamp Wednesday Challenge, I hope you join us again next week! Love your penguin, so cute!! Fabulous holiday card! Piali, this is adorable! Such a great card! Thanks so much for playing along with the Simon Says Stamp Wednesday Challenge! Fantastic design. Love your adorable Christmas card. Thank you for sharing it with us at Stamping Sensation. I hope you join with us again in our new challenge.